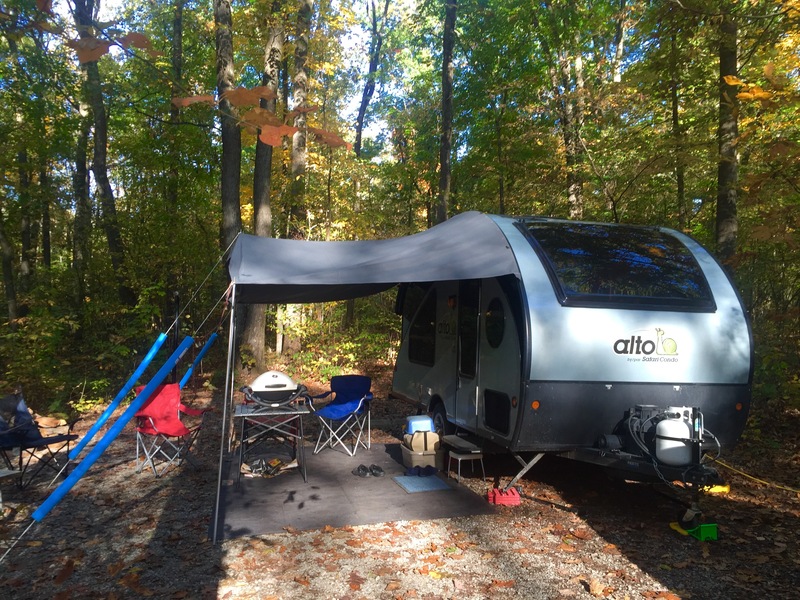 We arrived at Little Pine State Park (PA) on Oct. 9, making our way back southward toward VA. This is a nice campground, although it is cheek-by-jowl already on a Friday. Many families with children young and old, and Hallowe’en is in full bloom. Our across-the-street neighbors have rigged up 5 or more of these inflatable, lighted characters (Frankenstein, a haunted house, Smaug or some other dragon with wings, a ghost, spiders, etc.). Trick is that these gangly, moving objects sit right in front of a pathway/steep stairway up to the closest bathhouse to our site, right next to the camp host’s site (#82). On top of which, there are acorns all over the steps up, and two bathhouses are simply too few for a place with this many folks. They were always crowded with kids and parents, etc. The host came by and handed me a flier of all the stuff that would be going on for the local Fall Festival, beginning Sunday at noon. That explained all the families, because they had all sorts of pretty neat activities, including a falconer who would be doing a hawk talk during the fest. Our schedule would not allow us to take part, however. But during the rest of the day and the next, the campground became packed to bursting with campers of all types — including the hammock-camping flint-knapping presenter/teachers (who came to see Roomba as we were breaking camp on Sunday AM). Interesting pair, which seemed to be a father and son team. Anyway, we had some delicious chicken stew/soup that Gloria had brought for dinner, and her cold was getting worse, so we called it an early night. Saturday we were up and into the car to go see Jack’s Russell Family regional home. We had arranged already to meet up with his cousin Russ’s wife, Tracy (Russ was traveling in Mississippi visiting friends and fellow car enthusiasts) for Saturday dinner, and Jack has two additional cousins living in the area with whom we wanted to touch base — but we were out of cell service at Little Pine. We showed the K & G the Russell homeplace, and various haunts and distressed towns he remembers as — if not thriving, at least getting by — from his childhood. The more recent loss of jobs and economic stressors is quite evident in the area, but there are still some lovely neighborhoods with beautifully-kept gardens and lawns, and the leaves are changing colors, so it was a lovely drive. We saw a little pizza place and Glo had mentioned that she’d love to get a NY-style pie, so we stopped in and had what the cook called a “Garbage Pizza” meaning it had a bit of everything thrown on. It was yummy and we made all of it disappear. Back into the car, we frequently intersected with the Pine Creek Trail, a Rails to Trails conversion that Jack has actually ridden in the past. Glo and I were itching to get out and walk on the trail, but we were overruled by the pilot of the vehicle, so we headed to a cemetery instead. Glo and Jack do the genealogy thing, and that stop also gave some opportunity for cell phone calls. I called my mom back in Roanoke to check in, and Jack was able to get into touch with the additional two cousins (and their husbands), and with Tracy to set up a dinner spot and time. 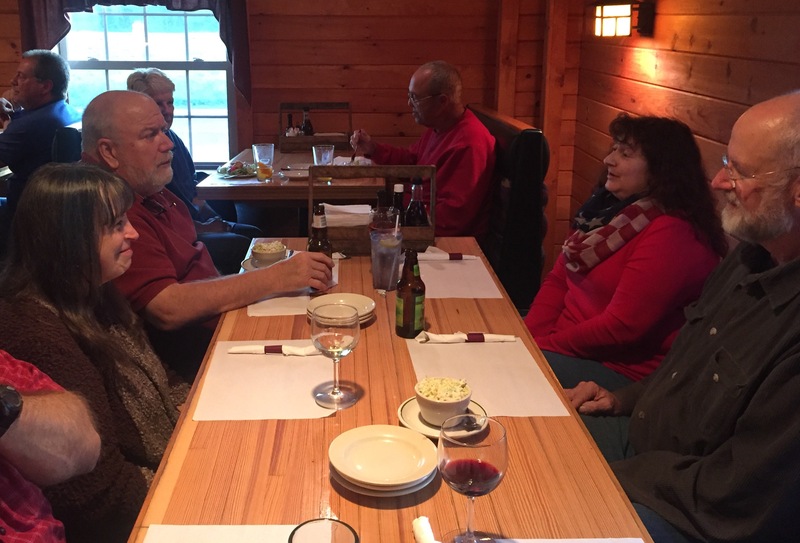 Then we drove by and made the reservations for an early dinner at a great spot called the Venture Inn, right on the Pine Creek Trail. Rumor has it (from the cousins) that the place used to be a rather scary dive/tavern, but was taken over fairly recently and really improved in atmosphere and food (and beverages). We had a really fun evening with Barb & Tony, Ginny & Bill, Tracy, and Glo and Kerry. Somehow, I managed to cut Barb (camera right) and Bill (camera left) out of the photo of us all at the table. Anyway, the food was great, from everyone’s reports. I had a 12 oz. slice of prime rib and it was really delicious. Even though we began early, we stayed late, and the conversation was lively, catching up on all the family news and doings. We drove back to Little Pine and headed to bed in the 9:30 range. We didn’t have to race to our next reservation as it was only about 3-4 hours drive away (Ohiopyle State Park, PA). But we didn’t need to dump any gray water, but talking to the flint-knappers set us back a bit. There wasn’t much to see en route, although it was a very pretty drive, up into and through and down from the mountains. Unfortunately, the photo ops from the car were very slim. After a lunch and break at Applebees near Johnstown, PA (the site of the great flood of that name that happened in the 1930s) we carried on and there were moments along the very narrow route when we were afraid we might hit a low-overhang bridge that Kerry could not traverse in his RV (that happened to us en route to Little Pine, and K&G had to stop and go “the front way” into Little Pine SP). 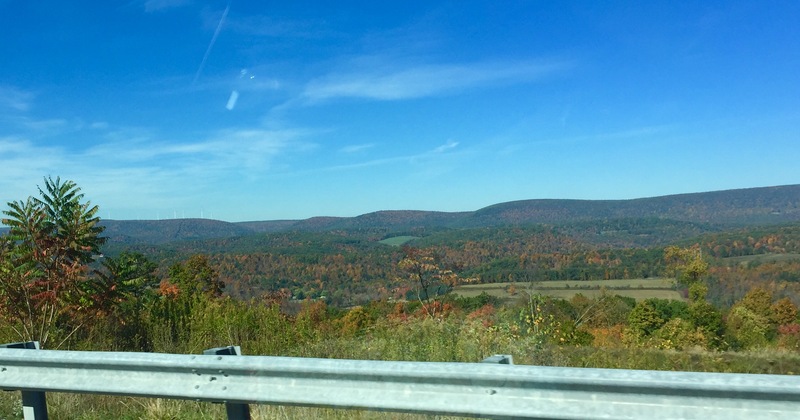 When we arrived in Ohiopyle, the town was thronged with visitors — walkers, hikers, shoppers, bicyclists, looky-lous, and leaf peepers. We were afraid that the campground would be similarly packed, but it’s far enough from the town that it was relatively quiet. But unfortunately, when Gloria helped cancel our friends’ reservation, the service also cancelled HER reservation. So we had to choose whether to keep our reserved space and be miles away from Kerry & Glo, or switch to a pair of campsites near one another. Since our plan was to continue to alternate the provision of dinner, we felt we would have to be near each other, so we picked a pair of sites at the end of a cul-de-sac, and pulled in. Leveling at all these sites is quite the challenge. The sites are all nicely separated from each other, and there are lots of drives and ways and “streets” down which the sites are aligned. But all among those from which we were able to choose were badly out of level. Kerry & Glo just couldn’t fully level their RV in the site near us; and we had to use additional 2 x 4 boards under the levelers for Roomba. Our site is #137, and K&G are in #135, off the road called Ginko. The little chipmunks are constantly yelling at us as we’re in “their” territory. But the sunshine through the golden and red leaves is simply lovely. I cooked a shepherd’s pie for us on the stovetop oven, but we were unable to find firewood for a blaze until Jack returned from a trip beyond Ohiopyle to find a seller. So we decided to postpone the fire circle until tomorrow night. Today is a holiday for most, so we’re going to take a drive in a little while, and Glo and I are definitely going to hike along the Great Allegheny Passage (GAP), which Jack and I have ridden our bicycles on in the past. I hope there will be some good photo ops as we tour the neighborhood. Sounds like a lovely trip! Enjoy every minute.